As mentioned “Cherry Blossoms Have Started in Kyoto“, Kyoto is welcoming the cherry blossoms aka Sakura. Depending on the place, the most breathtakingly beautiful time will be in five to ten days (around April 5 – 10th). Cherry blossom viewing is one of the biggest traditions and activities in spring in Japan. Therefore, for people who happen to be here during this season, be sure to go and check them out. And luckily Kyoto has an abundance of spots to see the cherry blossoms. There are some places which require an entrance fee such as Nijo Castle and Kiyomizudera Temple. However, there are a plenty of places where people do not have to pay at all. As the writer of a Kyoto e-Guidebook and local of Kyoto City, here are the three best “free” spots to see the cherry blossoms. For more useful information to make your trip fun, memorable, special and stress-free, please check our Kyoto e-Guidebook. This path starts at (near) Ginkakuji Temple and ends at Nanzenji Temple. Both are very popular sightseeing spots. Thus, sightseeing and cherry blossom viewing can be done at the same time (day). It will be extremely busy during this season so if possible take a taxi, especially if there are two to three people traveling together. For people who would rather take a bus, wake up very early and try to get there before 9 AM (getting on the bus before 8:30 is advised). City Bus – Take Line 17, 32, 203, 204, 100, or 102 and get off at Ginkakujimichi. Walk toward Ginkakuji Temple. Train – Take Subway Tozai Line and get off at Keage Station. Note that Nanzenji will be the starting point. 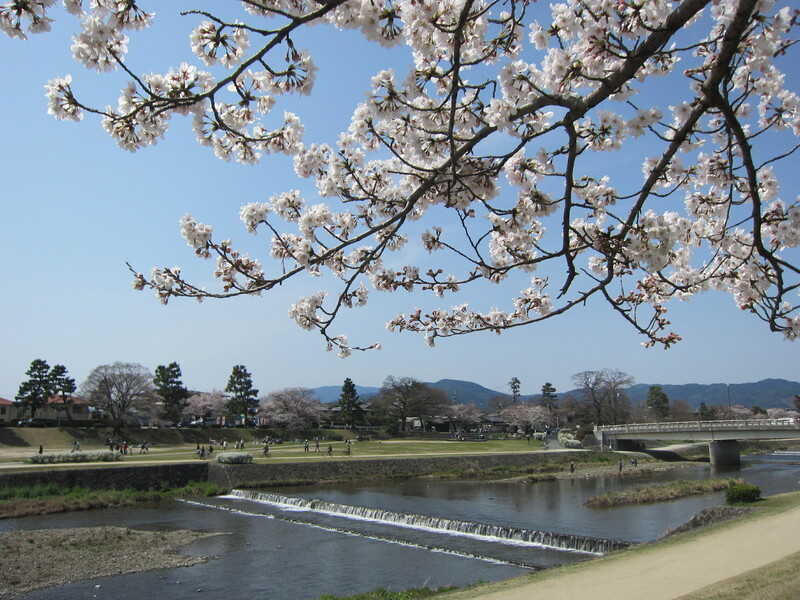 Kamogawa River is the river which runs through Kyoto City and is regarded as an icon of Kyoto’s beautiful nature. Along the river, beautiful cherry blossoms will be lined up. There are several nice spots near the river such as Shimogamo Shrine, Kamigamo Shrine (both shrines are designated as World Heritage Sites) and Kyoto Botanical Garden. Train – Take Subway Karasuma Line and get off at Kitaoji Station or Kitayama Station. Walk toward the river. Maruyama Park is located next to Yasaka Shrine. This park has many beautiful sakura trees, but the one that looks like a willow tree is the most magnificent. There are many sightseeing spots nearby, for example, Gion district, Yasaka Shrine, Kodaiji Temple and Chionin Temple. It is one of the most popular sightseeing spots, so if possible take a train and walk. City Bus – Take Line 12, 31, 46, 80, 100, 201, 202, 203, 206 or 207 and get off at Gion. Train – Take Hankyu Line and get off at Kawaramachi or take Keihan Line and get off at Gion Shijo and walk east.